On 29.06.2010, Siemens officially revealed its new Vectron platform, locomotives that have to guide Siemens into a new era, the era of flexibility rather than multifunctionality. 1 - The current models (2010) for electric locomotives that Siemens offers are the EuroSprinters ES 64 F4 and ES 64 U4. Both were developed for one specific customer, the German and the Austrian railways to be more precise. They comply to the specific demands of these two operators. However, they lack the flexibility that many other customers (smaller open-access operators and lease companies) desire. Theoretically being able to run in every country in Europe doesn't bring much for these customers, it makes the F4 and U4 expensive and stuffed with a lot of equipment that is never of rarely used. Siemens tried do down-trade the F4 and U4, but it was not a success. The market nowadays asks for machines that only just does that what's needed at that time. And when the service domain changes, a locomotive should be easy the adjust to its new environment. Flexibility has replaced multifunctionality. With the F4 and U4 Siemens has to search for customers that fit the machine's properties, in stead of offering a product that everyone could use. With EuroSprinter family, Siemens has no answer on the Traxx AC from Bombardier for example, nor the Traxx DC, popular models at this moment. With the Vectron, Siemens should be able to compete with the Traxx platform again, as well as the also newborn PrimaII platform from Alstom. 2 - Siemens also needed to take a next step as legislation and technical requirements progress. Driver safety, emission standards are getting more strict every year and there will be a moment that the EuroSprinters do not meet the standards anymore. When tha moment arrives, the Vectron should be there to take over. 3 - Don't forget that the development of the F4 started almost 10 years ago, back in 2000. In the mean time, also the technical possibilities have improved. Technically, there is more possible now, everything is more mature. Also the Vectron is a technical upgrade, everything up to date again. Driver Table design: For the Vectron, Siemens decided to hire industrial designers to reconsider the driver table set up. There are two base versions of the desk, a 'low' version, as shown in picture 1, installed in the AC-prototype and a 'high' version as installed in the MS-prototype, see picture 2. Which version to choose depends on the question how many detection systems are on board and how many displays/modules are needed to supervise them. When a locomotive with a low driver desk is being adjusted and more systems are added, Siemens will replace the complete table by a high version, instead of adding separate modules. Bogies: All Vectron configurations will have the same bogie design. Its technology is based on the 'Ritzhohlwelle' concept, already used for the EuroRunner models. Customers can order a 160 or a 200 kph version. Siemens experiences that the market requires a base version that can be used for both freight and passenger services when needed, so 160 kph is than the absolute minimum. With the current ES 64 F4 and its 'Tatzlager' propulsion bogies for 140 kph Siemens can not offer a suitable solution. When required, Siemens can adjust the top speed of 'Ritzhohlwelle' bogies, without exchanging them completely. This would approximately take one week. Cab windows: Remarkable is that the Vectron has no cab side windows anymore. As the Vectron has back facing cameras in stead of mirrors, Siemens marked such windows being redundant. 2017-04-07 [AT] The first Vectron tests for ÖBB have commenced..
[AT] The first Vectron tests for ÖBB have commenced..
Vectron DE locomotive 247 901 passes the Austrian town of Obereggendorf during a test run on March 16, 2014. Picture by Stefan Rottensteiner. 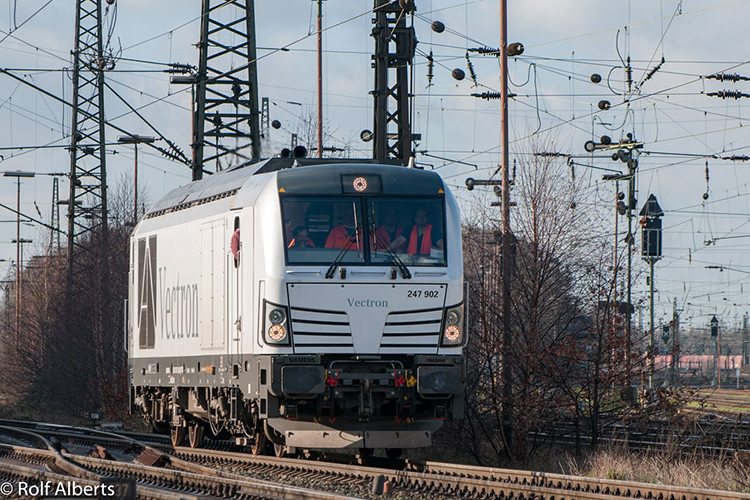 Rail Business reports: Siemens has booked a first success with its Vectron DE locomotive. In late November, Infraleuna ordered one locomotive, making it launching customer of the type. Delivery of the new locomotive will take place in the first six months of 2017. Since yesterday, Siemens Vectron 193 902 is in the Netherlands again. Th homologation of this type of locomotive for this country is still ongoing. Yesterday the machine ran light from Arnhem to Kijfhoek shuntyard. Today it has been used for trials between Lelystad and Zwolle. 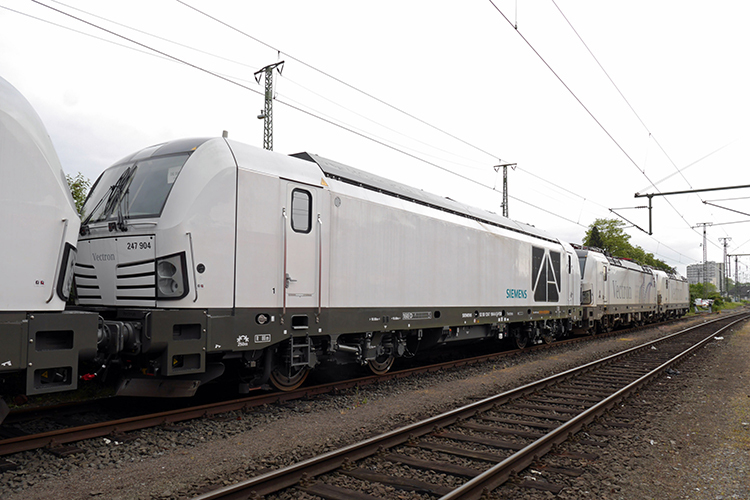 A fresh picture of Siemens' Medium power Vectron no. 192 961. The machine, with new NVR number and delivery date (02.09.2016) hauled a special train from Berlin to Munich on 24.09.2016. Thanks Michael Raucheisen. Today, Peter Frost and Krisztián Balla have sent in images of Siemens 193 970, the InnoTrans Vectron from 2014. It is on transport from Germany to Sweden and is equipped with a Danish ATC antenna. The CargoNet chapter for 193 923 and 924 has ended. This month, CargoNet gave them back to Siemens. The 923 was used for freight trains from Oslo to Bergen vv, 924 was already stopped as its wheels were worn out. At this moment they are on their way from Norway to Sweden, where they will be embarked in the harbor of Trellenborg. By ship they will continue their trip to Germany. Thank you Knut Ragnar Holme for the image. Remarkable: the machines have both lost their yellow snow ploughs. Update: pictures of the locomotives on transport in Germany. Well, that is a peculiar sight. Two Siemens stock locomotives, 193 930 and 970, were photographed on 08.06.2016, running on the large T1 test circuit in Wegberg-Wildenrath. In between these two white machines: ancient Swiss passenger coaches. What is tested here? Detail: it is the first time we see 193 970 without its 'Cheetah' stickers, that it had since InnoTrans 2014. Stopar Carlo sent us this fine image of the Siemens DC Vectron no. 191 001 in Italy. The locomotive is currently hired to freight operator InRail. The machine pulls an ethanol train from Villa Opicina to Ravenna and is seen here in Bivio D’Aurisina. Catch them before they go. These images show Siemens 193 923 and 924, both hired to CargoNet from Norway, at the workshop of Grorud near Oslo. The machines are being used for freight train to Bergen at the Norwegian coast, however the 924 was out of service when these images were being made. The machine needed some wheel reprofiling. Most likely, CargoNet will return the Vectron locomotives to Siemens in June, as the operator now has many extra TRAXX AC2s in its fleet, that were hired from Railpool after competitor CargoLink decided to stop its freight services. 2016-04-05 [SE] Who wants to drive the Vectron locomotives of Snälltåget? [SE] Who wants to drive the Vectron locomotives of Snälltåget? Snälltåget is a train operator from Sweden. The company is known for it passenger services in Sweden and operating the Berlin Night Express linking the German capital with Scandinavia. Now Snälltåget has announced it is looking for drivers, as it wants to run trains by itself, using its own personnel, starting in September. That is not all, the company also announces it will be using Siemens Vectron locomotives. We have been waiting for it, and today is the day: The Siemens Vectron arrived in the Netherlands. Test locomotive 193 902 crossed the German-Dutch border this morning at Venlo. From there, Railfeeding locomotive no. 18 took the machine from there to Rotterdam-Waalhaven. We already reported: Siemens>ELL>RCA locomotive 193 822 took a passenger coach and five carriages from Savski Marof (border with Slovenia) to Šid (border with Serbia) on 26.11.2015. This image above was taken when the locomotive came back. 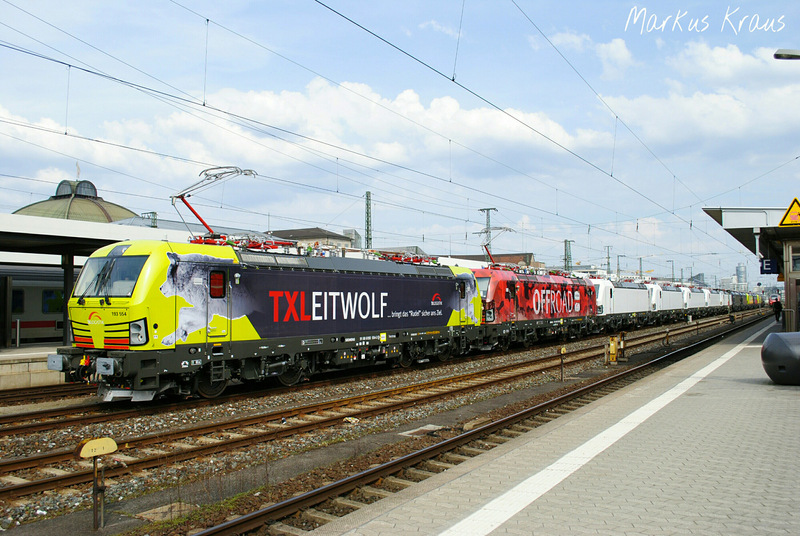 Like many other operators, ITL is curious for the Siemens Vectron DE. So the freight operator decided to use 247 902 to see how the machine performs in ITL's everyday practice. Since November 10, the locomotive in use for a two-week period. According to this post on DSO, the loco is tested on trains carrying construction materials. It is rumored, Hector Rail wants the Vectron experience. It is not known yet which operator is using the 193 822 at this moment. And a little more about the history of Siemens' Munich plant here. As of 10.09.2015, Siemens Vectron 193 901 is in Italy. It's the first time the multi system version of this Siemens locomotive is in this Southern European country. 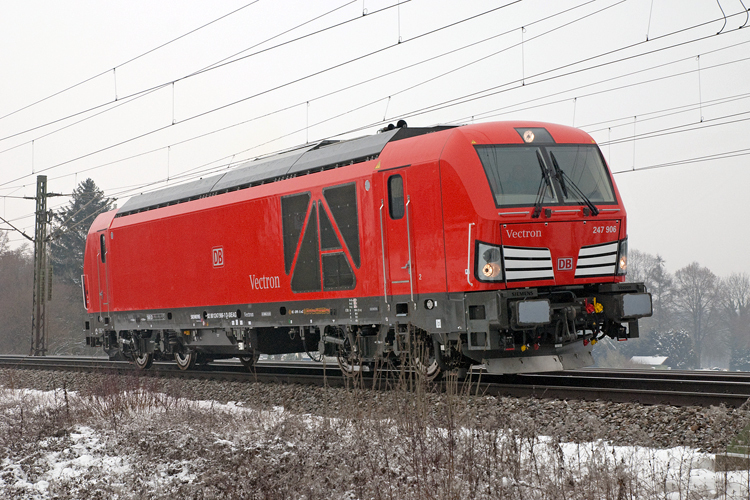 It is official now: the cargo version of the Vectron DE has received authorization for the Austrian railway network. The loco was already certified for Germany, allowing the locomotive to be used within and between the two countries. An impressive image made yesterday by Vladimir Fisar. 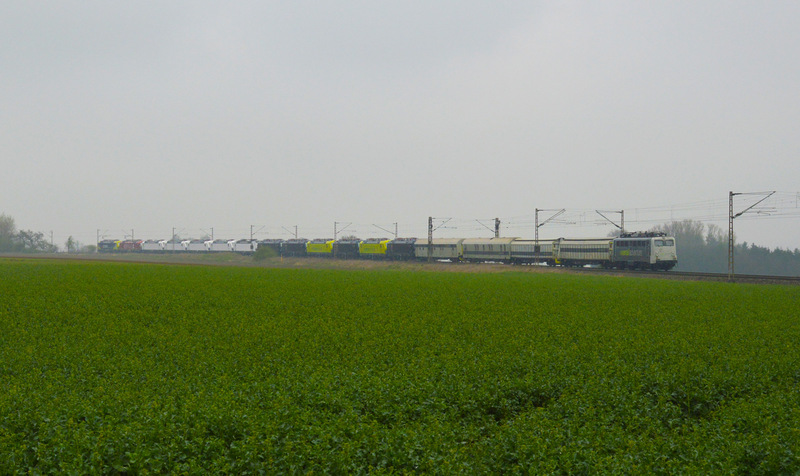 There are six white Vectron locomotives in Velim, and together they make test rounds. The locomotive numbers? 193 822 and 823 (MS), 193 930 (AC with diesel) and 5170 020, 021 and 034 (DC). Remarkable: one of the DC locomotives sports small Freightliner logos. On 15.06.2015, a Siemens Vectron locomotive (Railcolor: 193 822) arrived at the Rail Cargo Terminal / BILK in Budapest. 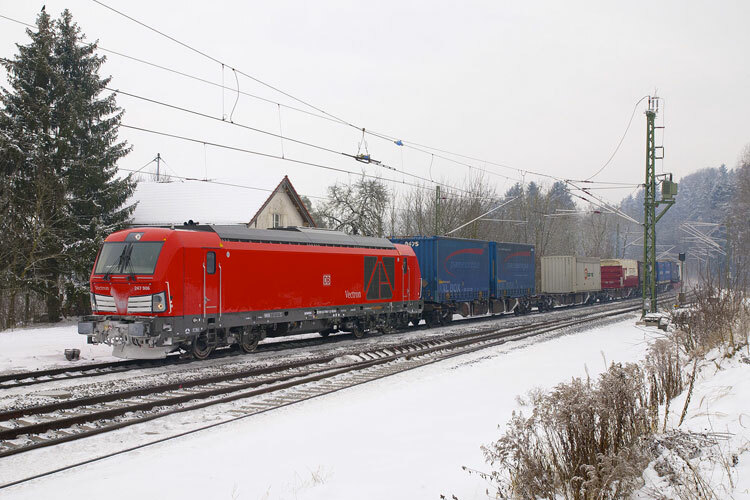 The locomotive successfully completed a 650 km test run with a Rail Cargo Group (RCG) freight train, from Sežana (Slovenia) via Zagreb (Croatia) to Budapest. RCG wanted to evaluate the possibities of the Vectron locomotives and its interoperability. Interesting is that the machine also can be homologated for Italy, so it could be used to bring freight trains from Triest (Italy) to Budapest in one haul. Arnulf Wolfram (Siemens AG Österreich) and Georg Kasperkovitz (Rail Cargo Group) met in Budapest, when the train arrived, as the picture shows. On 01.06.2015, Siemens 193 822 was seen in Câmpina, Romania. The test bed locomotive left Bulgaria after completing the homologation runs on 27.05.2015. We showed you the RailAdventure transport with several locomotives two days ago. 187 009 und 193 901 were parked in Mannheim, as shown in the two title images. NS E 186 016 and 017 were taken to Emmerich and continued their journey into the Netherlands, to Amsterdam. Siemens: In April, Siemens’ Vectron electric locomotive was sent to Bulgaria to undergo authorization tests. The tests were carried out near Sofia, the capital, as well as on one of the main lines connecting the western and eastern parts of the country. Authorization will enable the Vectron family to further extend its coverage by serving an important freight corridor between Europe and Asia. The locomotive used for the trials was the 6,400-kW multi-system version of the Vectron equipped for running on both AC and DC power. A special 1,600-ton freight train was used for the trials and consisted of 13 freight cars as well as a second electric locomotive at the rear. Part of the tests were conducted on the picturesque sub-Balkan railway line, which is one of the toughest routes in terms of topography, featuring the longest gradient in the network with 16‰. The test route also included the Koznitsa tunnel, the longest in the country at nearly six kilometers. The envisaged authorization of the Vectron in Bulgaria marks an important milestone in the roll-out of the Vectron family in Europe. Intermodal transport between Europe and Asia has seen a substantial increase in recent years. Some of the leading European freight operators are introducing new services such as shuttle container trains and trailer transport between Germany and Turkey. When authorization is finalized, the Bulgarian link will complete the rail corridor from Germany to Turkey. Dnes proběhla na zkušebním okruhu v Cerhenicích u Velimi prezentace lokomotivy Vectron "Last Mile"
On 26.03.2015, four white Vectron locomotives were seen entering the Czech Republic. Now we know which machines were seen that day: Siemens 5 170 020+021 (formerly hired to DB Schenker and stickered red), 5 170 034 and multi system 193 823. It means there are no Vectron DC machines at this moment in Poland, other than the red ones delivered to DB Schenker Rail Poland. Siemens testbed Vectron 193 971 on its way to Kontiomäki in northern Finland. There it performed for trials on a test track at Laajakangas on 19.04.2015. These photos were taken at Malmi near Helsinki. It was mentioned before, but today Siemens has officially published the information that their Vectron locomotive is fully homologated for both the Czech Republic and Turkey (Railturkey.org stated this was already done on 07.11.2014). The Czech Rail Authority has granted final and full authorization for the Vectron multi-system and AC versions to operate in the Czech Republic. The Vectron locomotive can therefore run on all sections of the Czech network without any restrictions. Following the successful conclusion of all tests in 2014, the Turkish State Railways (TCDD) authorized the multi-system version of the Vectron locomotive in March 2015. The authorization covers the entire Vectron family, paving the way for the Vectron’s operation in Turkey. As part of the authorization tests, a Vectron equipped with Turkish and European train control system (ETCS) not only operated on conventional routes, but was also tested and used in service on the high-speed rail line between Istanbul and Ankara operating at speeds up to 200 kilometers an hour. The Vectron mastered all the commercial test operations as well as heavy-duty loads. The tests covered a total of more than 25,000 kilometers. Vectron 193 822 meets former UK and Danish electrics. All possible in Bulgaria. The Vectron is hot in Switzerland. Sure now BLS Cargo has ordered 15 units. Meanwhile Siemens is busy testing, as the machines still need to get several approvals. As we already reported, Siemens Vectron 193 822 has arrived in Bulgaria for homologation tests. A series of images made in Tulovo station. 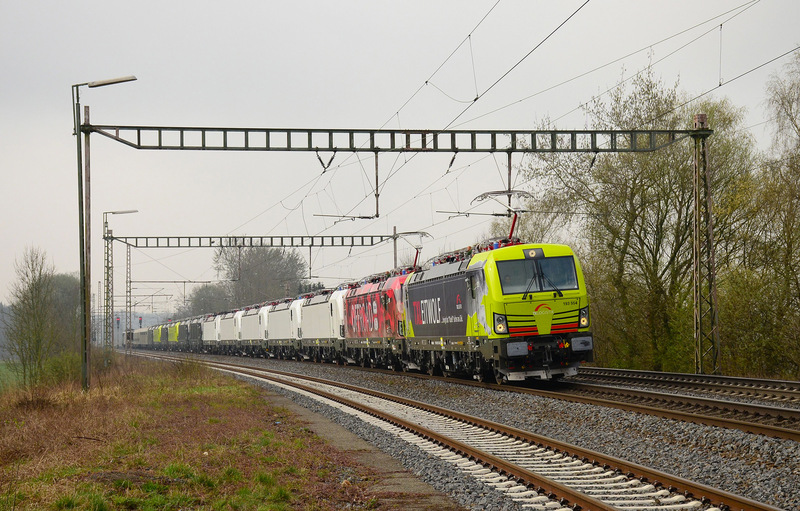 The locomotive is now on its way to Pirdop, where tests are expected to begin, in cooperation with DB Schenker Rail. Per 25.03.2015, both the Vectron AC and MS versions have the full approval for the complete network of the Czech Republic (3 kV DC and 25 kV AC). Of course, the Vectron AC can only run on the 25kV AC part. Impressions of the 193 822 in Croatia, in Vedro Polje and Sunja, made during a test run of the machine from Zagreb-Resnik to Slavonski Brod on 10.3.2015. On 28.02.2015, Siemens Vectron MS no. 193 822 to Sovenia. RailAdventure took the machine down south with the historic green NiBK locomotive no. 1245.05. During the next five days the 822 compelted many test runs in Slovenia. The tile images shows the machine in Crnotice (Koper) on 05.03.201, running from Koper Smir to Lubljiana Moste. Good news, the Bergensbanen is open again. But it was hard work to get the derailed train back on its track. Quite some snow to move. Since yesterday, RailAdventure has a second locomotive in its fleet for testing and transport services: 103 222. Last night it completed its first job after an extensive overhaul at the DB Dessau workshops: taking the new Siemens stock locomotive 193 930 from Munich to the Czech border. The white Vectron will continue its journey to VUZ Velim test centre in Cerhenice (CZ). A year and three months after passing through Bulgaria for the first time, Siemens Vectron 193 821 (now homologated as TCDD class E87000) was spotted on its way back from Turkey at Iskar Station on a snowy day in Sofia. The promotional stickers the loco initially sported are gone, but the 87000 designation still remains. 2014-12-13 [TR] The new E87000 series: The Vectron homologated in Turkey. [TR] The new E87000 series: The Vectron homologated in Turkey. Lately we have informed you on the preliminairy type approval of the Vectron MS in the CZech Republic and Slovakia. 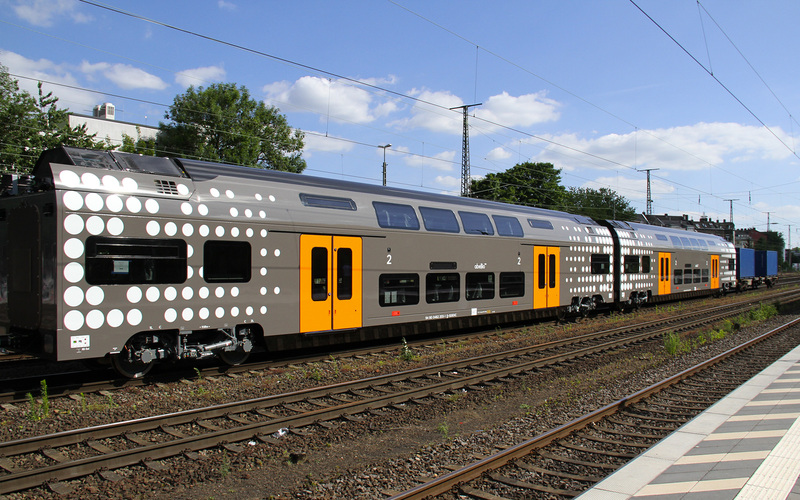 On 10.11.2014 also Vectron DC locomotives were granted approval for 'commercial test service' on the Czech network. [update] The approval is restricted to lines from the PL/CZ border to the stations Petrovice u Karviné, Bohumín and Lichkov. This permit is valid for the Polish Vectron DC locomotives with the service number 5 170 034 - 049. The first one of this batch is a white Siemens demonstrator locomotive. The others are red and in service of DB Schenker Polska. It has been six months already, since Vectron 191 001 has moved. Now the second part of the dynamic test program has started. Both engines are part of a batch of five to be delivered to Railpool (193 810-814). The Norwegian Railway Authority (SJT) granted authorization for the AC version of the Vectron on July 1, 2014. The Vectron AC is designed to operate on alternating voltages of 15 and 25 kV. This authorization applies to Vectrons built for a nominal rating of 6400 kW and a maximum speed of 200 km/h. Railcolor: CargoNet is already operating two Vectron-locomotives in Norway: 193 923 and 924. Update: The test run of the Vectron and these coaches is a result of the good cooperation between Siemens and DB Regio Nord-Ost. This cooperation was established in 2010 when the DB 182 series locomotives had to be adjusted for the passenger trains of DB Regio. The two Vectron locomotives adjusted for services in Scandinavia, together at the Grorud workshops in Oslo [NO]. [Update] An image from today of the 193 924 in Oslo, Norway. These images show the Vectron for Italy homologation test train. In this composition, it made two short runs from Florence to Empoli on 14.02.2014. Since Monday, 17.02.2014, the test train is running from Florence to Pisa and back. This will continue all week. The 962 arrived in Wegberg-Wildenrath test center last year. 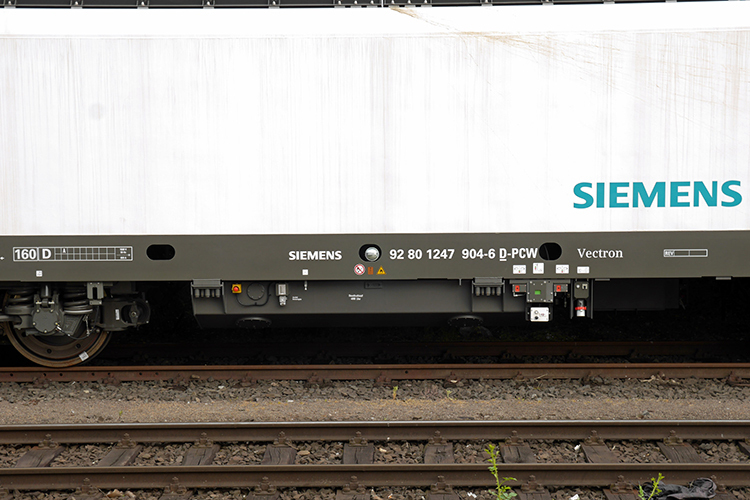 The 961 arrived last Friday, and it was the first time we saw this locomotive outside the Siemens Munich factory. Based on the dirt on its side, the 961 is not completely and most likely already stored in Munich for some time before it traveled the north. As as we know, these two locomotoves are the only Vectron AC locomotives with 5.6 MW duration power. They therefore represent the medium power configuration of the AC type. The are also the only Vectron electrics with destination displays. All other AC and MS machines have 6.4 MW duration power under AC catenary systems. On facebook, Siemens announces the start of the first trials with the Vectron. Multi-system locomotive no. 193 821 was sent to the Bosporus in September 2013 for this purpose. Apparently Siemens regards Turkey as an interesting market for its Vectron locomotive platform. It mentions the optional shunting module (up till now only installed in a AC locomotive) for this locomotive being interesting for this country. The relation between Vectron and passenger services is getting stronger. More operators seem to be interested. As we have already written in the Railcolor book, the (multi system) platform locomotive is currently the best alternative for (new) passenger operators that want to enter the fresh market for international passenger services. Locomotives are available, and most important, have the necessary approvals for many European countries. Combine them with second hand or new coaches and you have a good solution for the short term. In the more distant future, train sets are likely to take over, but it will take time to develop suitable concepts, affordable to open access operators. For now, we see good opportunities for loco-hauled, medium distance passenger trains in for example Sweden, Germany, the Czech Republic and in the Netherlands and Belgium. With its ready to go 200 kph version of the Vectron, Siemens can play a strong card here. A comparable Bombardier Traxx version is not available at the market. Only Skoda can offer an alternative with its 200 kph 109E platform right now. Next to a high maximum speed, both the Skoda 109E and the Vectron comply with TSI high speed regulations. This is of great importance when you want to run on connections that include high speed rail sections of the ever growing high speed network in Europe. When looking at older types, the ES 64 U2 (hkx, DB Fernverkehr, Hector Rail> Veolia) and ES 64 U4 (EuroCity's in HU/CZ/DE/AT/SI/CH and IT) can also still be an alternative, but not on networks including high speed networks. BTW, we have updated our Vectron type list. The Turkish railways (TCDD) placed an order for seven Velaro high speed trains in July. Six trains will be newly built sets. They will be operated on the Ankara - Konya and Ankara - Istanbul routes. On 17.09.2013, Siemens in Munich released a new Vectron multi system locomotive. Unit no. 193 820 is the third MS configurated Vectron that has been built, after 193 901 and 193 902. On 18.09.2013, the locomotive arrived in Poznan (PL). From there it will continue its journey to Warsaw. It will not be presented at the TRAKO fair of next week. In early June, stock locomotive 193 961 was converted into the black 193 840>850 for MRCE, displayed the the Munich t&l fair. Another stock locomotive, 193 963, has visited Wegberg-Wildenrath in the past couple of months and is now being used as test locomotive on the German public network. Several weeks ago, the 963 was therefore renumbered as 193 841. It's livery is still white. This week it runs from Straubing - Plattling vv (see images below). 2013-07-22 [DE] Vectron 193 963! Vectron 191 001 was released from the Munich-Allach plant last February. Since then it has been in Siemens test center in Wegberg-Wildenrath, being prepared for the homologation process in Italy. Italian open access operator Fuori Muro has two Vectron locomotives on order. For this order, the homologation for Italy is eveidentially of big importance. From 18-20.06.2013, the Czech Raildays railway fair was held in Ostrava. Vectron 193 922 was presented there, still sporting its Shunting Module-stickers. State of the art rolling stock was there in many different forms: Pesa Link and ELF, Skoda trainset, Vossloh's G6, modernised Skoda locomotive 361 102 for the railways of Slovakia and many track construction and maintenance vehicles. This week Siemens published, that its Vectron platform got its approval for Sweden. They expect Norway to follow soon. Following succesfull winter testing in northern Sweden (Railcolor: with Vectron 193 923), e.g. on the Iron Ore Line to Kiruna, Vectron had received a temporary homologation for the swedish network. Afterwards the vehicle had been used in commercial service until October 2012 covering a mileage of more than 100,000 km. Effective April 30, 2013, the unlimited homologation has been granted. As the 5170 024-033 numbers are used for the ES 64 F4-450-459 locomotives, the 034 is the next one available. One would almost forget it, but one Vectron locomotive is still making its round in Scandinavia. In both Norway and Sweden the German locomotive is tested under severe circumstances. For Sweden the Vectron already has a temporary, official approval. 193 922 is back from its submerging adventure. Last weekend Eurotunnel and Siemens successfully tested the Vectron locomotive in the Channel Tunnel. The tests represent efforts on the part of Eurotunnel to develop cross-channel rail freight. The tests validated the compatibility of the locomotive with the systems and safety regulations applying to the Channel Tunnel. They were carried out with a Vectron AC locomotive in standard configuration where only the two pantographs had been replaced. The test runs confirmed that the Vectron can operate without any problems in the Channel Tunnel with its gradients of 11 per mille, pulling trains of 1,350 metric tons. "We are pleased to have succeeded in demonstrating the exceptional performance of the Vectron here, too. True to the Vectron slogan of "Creating corridors", we have been able to show that it is feasible to operate a standard vehicle safely and reliably in the Channel Tunnel", said Karl-Hermann Klausecker, CEO of the Siemens Business Unit Locomotives and Components. Railcolor: Siemens' efforts to get the Vectron approved and homologated for many different countries and services slowly pay off. The Vectron is becoming the most widely accepted platform in Europe. It can run in the tunnel, complies with TSI High Speed regulations and in the mean time has approvals for Poland, Romania, Germany and Sweden. On Dec 21, 2012, the German Federal Railway Authority granted the first homologation for a Vectron locomotive – the AC version with a rated power of 6.4 megawatts, designed for a top speed of 200 km/h. This version is the first from the Vectron platform to receive homologation. A distinguishing feature of the Vectron platform is the compatibility of certain elements of other vehicle versions with the homologated locomotive. For an AC or multi-system locomotive, other customer-specific versions can be certified through a delta review based on the first prototype that has now been granted homologation. In order to qualify for national homologation, the Vectron required successful Europe-wide certification in compliance with the valid Technical Specifications for Interoperability (TSI). This EU certificate reduces the required extent of national testing within EU states. Siemens must have been thinking. When you use your locomotives in pairs (like the 189s in ore traffic in the Netherlands), why not removing one cab and couple them together back to back? Or maybe an operator wants a single cab Vectron, just to have a more aerodynamic passenger train composition? With the high grade of modularity of the Vectron this is easy. Just replace a front cabine module by a closed module. How that might look? The images provide the answer. During the fair, Siemens showed its latest addition to the Vectron program, the AC Last Mile version. Former 193 922 (presented at InnoTrans 2010) got a Last Mile module with a 180kW diesel combustion engine. Siemens managed to put all additional equipment in just one package, so using only a minimal amount of space possible for the extra feature. Logically, also the Vectron DC can have a Last Mile feature. The Siemens Vectron Last Mile is far ahead of competition, as the platform it belongs to has been trough most of the homologation processes in Europe now. The new TRAXX and the Gama still have to start dynamic testing. This will at least take 1-2 years. The Vectron DC is no prototype anymore. Today we inspected the Siemens 5 170 020, the Vectron 5.2MW locomotive for DC voltage systems, intensively tested in Poland. The machine was also present at Innotrans 2010, but as unit. 191 951. In cabine one, Siemens has proudly placed the official document from the Polish UTK, which tells us that the Vectron is homologated officially, without any restrictions, for their country. The Vectron DC is officially approved for Poland since last Friday (14.09.2012). Also, Siemens does not want to call this specific machine a prototype anymore. Many of its components have been tested for millions of kilometers in other products. The 5 170 020 itself also completed 70.000 km already. The Vectron locomotive family has received its EC Certificate from Eisenbahn-CERT (EBC) in Bonn (Germany), the Notified Body for Interoperability of the Federal Railway Authority. This means that Vectron fulfills the requirements set out in the Technical Specification for Interoperability (TSI) relating to rolling stock operating on the trans-European high-speed rail system (TSI HS RST), making it the first locomotive platform to be certified according to this specification in Europe. On the basis of this certificate, the Vectron can be approved for operation in all EU states. Additional evidence only has to be provided for compliance with applicable national requirements not covered by the TSI. Ulrich Wiescholek, Head of EBC, said: "The EBC took the platform concept particularly into account during the EC verification procedure. Each locomotive variant within the ‘Vectron family’ has the same basic configuration and – depending on the locomotive's specific area of operation – is further equipped with individually selected configuration packages. By establishing ‘verification modules’, which span a range of parameters as large as possible and enable modular combinations, ressources, time and costs associated with variant verification can be reduced. This means that a new variant can usually be certified at a low cost and within a very short space of time." Vectron locomotives fulfill the TSI HS RST specification for class 2 vehicles operating on the trans-European high-speed rail system (vehicles with a maximum speed from 190 km/h to 250 km/h) as well as the TSI SRT (Safety in Railway Tunnels), which covers large parts of national fire protection requirements in Europe. In addition, the Vectron complies with TSI PRM (Accessibility to Persons with Reduced Mobility) and the noise level requirements set out in TSI HS RST as well as in the specification for the trans-European conventional rail system TSI NOISE. In the past weeks, there was a small run on the very last stock units that Siemens built in 2011. Stern&Hafferl got two, and Metrans three machines, leaving only one white machine (Siemens 21690 / Siemens Vorratslok no.65) for sale. This Vectron news is part of a Siemens pre-Innotrans press package. All information can be found on this dedicated website. Customer requirements make locomotive manufacturers creative. With new orders they can extend their product portfolio and implement new sub version to what is already available. Siemens however subscribes the versatility of its Vectron platform by presenting alternative and creative configurations by itself. In 2010, the Vectron-quartet was the surprise of the fair. DC, AC, MS and even a diesel-electric locomotive was presented, all built with the same building blocks and modules. Innotrans 2012 will be about extending the range, partly in practice, partly in theory. At the fair, a Vectron locomotive with additional diesel-generator will be presented. The generator will be an extra module available to all AC and DC versions of the Vectron. One can look at it is a direct response to Bombardier and its TRAXX AC3 locomotive with 'Last Mile' equipment. A useful, hybrid solution for smaller operators, with small fleets, that don't want to be dependent on the availability of a local diesel locomotive, which is not under their control. However, Bombardier decided to implement it in a whole new base version of the TRAXX platform, and it is not known of the 'Last Mile' feature can be implemented in a TRAXX AC2 (185.2 seires) or a TRAXX DC (483 series) locomotive. In the past two years, the Vectron has been tested and homologated extensively. First approvals are through (RO) or almost completed (SE,DE,AT). The first new TRAXX still has not left its safe-haven in Kassel, more than a year after its presentation, so still has to go trough all the testing. Siemens can strike back here, if they manage to get new orders. Because that is the big question with the Siemens Vectron; who will buy it. Of course, it has been developed for the longer run, but Siemens has invested a large sum of money that it wants to earn back. They won't be able to do that with six units for Railpool and two for FuoriMuro. However, new, bigger orders are expected. In Europe, the state railways of Finland and DB Schenker in Poland want to modernize their fleet for example. And don't forget that the know-how of the Vectron will also be used for the Cities-Sprinter project for Amtrak. We don't expect a prototype of this one, but yes, it is possible of course to built a Vectron with only one full-fledged cab. A cab is a module on its own and can easily be replaced with something less complicated (the „Heck-End“ is born). And Siemens has done it before, with the diesel-locomotive for Iran. One such unit could be in passenger services. Two units, coupled back to back, can serve as double-locomotive for heavy freight duty. But ideas are nice and evident, but both configurations are not very common in Europe. Passenger operators only decide to order such a locomotive if their fleet composition leaves them no other option. Train sets are going for the win here. Quite an extensive update from Siemens, about the progression of all Vectron homologation projects. First the big news, the first unlimited homologation is there. The Vectron is now fully approved for... Romania! A country, interesting for customers of the Vectron AC locomotive. Furthermore, preliminary homologation has already been issued in Poland and Sweden. In Poland, Vectron DC 191 951 and 952 are being tested extensively in both revenue passenger and freight services. In Sweden, Vectron AC 193 krupp_2884_02 is used for trials. Operators such as Rush Rail are fond of the new locomotive. In Poland, it was able to pull a coal train weighing roughly 3,800 metric tons up a six percent gradient between Zawiercie and Warsaw without any problems. In a further test with 4,000 metric tons on level track, it reached a speed of 15 kilometers per hour after just 200 meters. The tests were carried out with Vectron DC 193 951, which has a service weight of 80 metric tons and tractive power rating of 5,200 kW. The locomotive is currently in service at DB Schenker Rail Poland under supervised operation as part of homologation activities. In Poland, it was able to pull a coal train weighing roughly 3,800 metric tons up a six promille gradient between Zawiercie and Warsaw without any problems. Its sister locomotive, 193 952, is also being used for the same purpose by PKP IC in intercity service between Warsaw and Kraków with a top speed of 160 km/h. The route is operated twice daily, covering a total distance of 1,250 km. The complete news item on kurierkolejowy.eu. The Siemens Vectron DC is now transporting freight and passengers in Poland. The authority granted approval in November 2011. Siemens received the preliminary approval for DC locomotives from the Vectron family in Poland. It Must now prove its worth in the Polish winter. In November 2011 the Polish approval authority Urząd Transportu Kolejowego (UTK) granted Siemens preliminary approval for the DC variant of the Vectron locomotive. The two locomotives with the serial numbers 5 170 020 and 5 170 021 are equipped with the SHP Polish train control system and have been in operation on test trips in Poland since 2011, e.g. in the testing area near Żmigród. In the coming months they must prove their reliability in freight and passenger transportation in order to obtain permanent approval for operation on Polish rails. To this end Siemens is working together with three Polish railway companies. The handover of the first vehicle (020) to the first operator – the DB Schenker Rail Polska railway company – took place last Friday. Further partners will include ITL Polska and PKP Intercity. The DC variant of the Vectron is designed for a three kilovolt system and is thus suitable for networks e.g. in Italy, Poland, Slovakia, Slovenia and the Czech Republic – provided that the corresponding train control systems have been installed. The locomotive has a maximum power of 5,200 kilowatts and a tractive effort on starting of 300 kilonewtons at a weight of 80 tons. During trial operation in Poland it will run at speeds of up to 160 kilometers per hour. The Siemens Vectron family celebrated its world premiere at the InnoTrans International Trade Fair for Transport Technology in Berlin in September 2010. Three months later the Munich-based locomotive rental company Railpool purchased the first six vehicles. Siemens Mobility just extended the Vectron photo contest by one month until July 31st, 2011. The contest is open for professional and amateur photographers. The best pictures will be published in the Siemens Vectron Calendar 2012.
update: Great report about the rolling stock high light of the CRD2011 on Zelpage.cz. Check the Gravita of Leo Rail. Today, Vectron 193 902 emerged in München Nord, supported by two class 152 locomotives. The engine still has its Innotrans vinyls. D-RADVE markings have been added to its NVR-number, telling us that it is 'running' under the license of Rail Adventure. Vectron MS - 193 902 - Another multi-system unit to be used accross Europe, it's decorated with red front markings for Italy. It will be named next wednesday as 'Werner von Siemens'. Vectron AC - 193 922 - The second AC-machine for services in Germany and towards Eastern Europe. Vectron DC - 191 951 - A new one, for DC (3 kV) only. Its UIC ratser tells us that Siemens aims at the Polish domestic market first. On one side, the DC unit has automatic couplings, to show this feature. Vectron DE - 247 901 - The unexpected surprise, a diesel Vectron. A machine with a 2400kW MTU engine. It has features for passenger services, as there is a display up front for example. 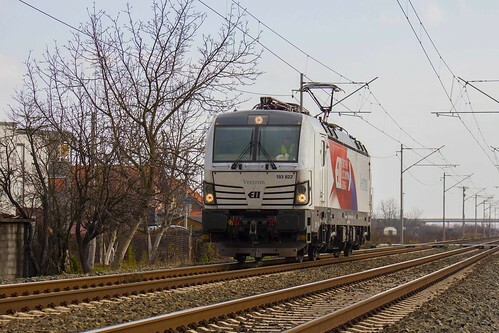 The first dynamic test runs on public tracks with a Siemens Vectron locomotive have started. With a test train of FTZ Minden, AC-unit 193 921 is making its first meters on the German network. Unit 193 921 is configurated for services on AC-networks only, and has to compete with the Traxx AC2 (185.2 series) built by Bombardier. The UIC raster of the 921 gives us an example of what Siemens thinks is an important service domain fur such a locomotive: the Germany-Austraia-Hungary-Romania-Slovakia corridor. Today was an important day for Siemens: today they officially presented the new Vectron platform on the Innotrans Pre-Press Conference in Dusseldorf and Wegberg-Wildenrath, Germany. The Vectron will redefine and widen the Siemens product portfolio for electric locomotives. Today, two Vectron units were present at Wegberg-Wildenrath. One was making its rounds on the main ring; 193 901, a multi-system high power (6,4 MW) version with a top speed of 200 kph. In the workshops a second unit was available to the always curious press people; 193 921 a 200 kph high-power Vectron for AC voltage systems only, to be certified for Germany, Austria, Hungary, Slowakia and Romania. A third and fourth prototype will be built to get the certification process in the highest gear. After a general presentation in Dusseldorf, Siemens invited the press to visit its Wegberg-Wildenrath test center for a first direct confrontation with the new Vectron. Inside, the white painted Vectron prototype no.2 was parked, accompanied by MRCE-Dispolok ES 64 P-001 and three Siemens demonstrators: Siemens ER 20-2007, Siemens E 189 840 and 183 701. Also, all main pillars of the current Siemens' locomotive program (all in a common white and silver livery) were available to the press and, one day later, also for potential customers. The Vectron got all the attention, but of course, with some serious homologation, certification and fine-tuning processes ahead, the current EuroSprinter and EuroRunner platforms still have to push the sales numbers for the upcoming time. The presence of the ES 64 P-001 'Werner von Siemens' was more or less symbolical. On presentation day, many different, interesting locomotives and trainsets were present at the Wegberg test center. Several Desiro-UK train sets for First ScotRail, several Desiro-ML sets for the Belgian railways; 189 series locomotives for DB Schenker, ES 64 F4s, old and new for MRCE Dispolok, some Spinter train sets for the Dutch railways. An IranRunner was hidden in between the stacked ES 64 F4. Although many class 18 locomotives for the Belgian railways were transported away from Wegberg in the weeks before the presentation day, still some 15 units were standing around in Wegberg. When the tape came of, redesigned front hatches and lamp fittings were revealed. Siemens did put some extra effort in giving the new platform a little more an identity of its own. The headlights are now placed into silver painted light houses, the front hatch now has a serious grill, with 8 openings, reminding us a bit about Scania trucks. The frame ends also changed. From now on we know exaclty if we are dealing with a Vectron or not, as the name is perforated in the frame end above every right buffer. In Wegberg, Siemens did say that a diesel-electric version of the Vectron would be possible, but that this was something for the distant future... But the future was near! At Innotrans 2010 Siemens presented to Vectron-DE, unit no. 247 901, as a surprise for all customers and competitors. Its body is approximately 1 meter longer that the electric version, but the overal design is very similar. The Vectron-DE can be delivered with power outputs ranging from 2000 to 2400 kW. The unit at the fair had a MTU 16V 4000 R84 engine, rated at 2 400 kW. With this engine, the Vectron-DE meets Euro Stage IIIB emissions regulations. The Vectron-DE is available for both freight and passenger services. The 247 901 at the fair more or less had the passenger-configuration, with destination displays integrated in both front hatches. surprise no.3: another 4 prototypes! With the four new Innotrans-prototypes, Siemens had six locomotives at its disposal for testing and homologation projects. Two Multi-System units to run accross Europe (193 901 and 902), two units for alternating current voltage systems, important for corridors towards Scandinavia and Eastern Europe (193 921 and 922), one machine for the Polish and Italian domestic markets (191 951) and diesel-Vectron. The ambitions of Siemens are very clear, they will no longer watch from the sideline, to see Bombardier getting awarded with all important orders, as happened in the past decade. With the Vectron, Siemens has the exact same four base configurations as Bombardiers has developed for its Traxx family, MS, AC, DC and DE.